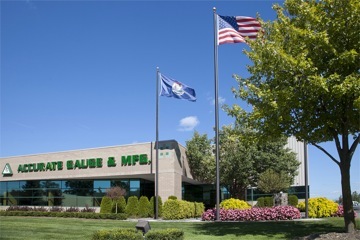 Machesney Park, Illinois – Accurate Gauge prides itself on the company motto that says, “The quality is not in the product, unless the quality is in the process.” As this busy Rochester Hills, Michigan machine shop can attest, the machining and assembly of large ductile iron castings into components for the heavy truck and military drive train markets is one that demands accuracy at every turn. Correspondingly, the heavy-duty manufacturing equipment here includes a line of Niigata SPN 701 horizontal machining centers (HMCs) with multiple pallets, used for machining very large, heavy workpieces with accuracy that ranks among the highest in the machine tool world market. 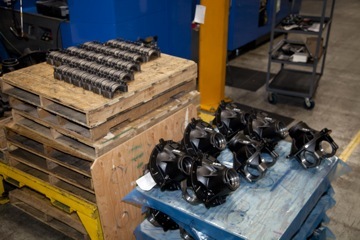 As a result, Accurate boasts the industry leaders among its customers, including Meritor, Axle Alliance, Dana and Mack. The shop machines over 98% of its workpieces from ductile iron and the iron sludge build-up in the coolant tank is an all too familiar problem for the production personnel. As Accurate’s engineering manager Mark Tario explains, “We approach every machine with a keen eye on machine uptime and an absolute ease of maintenance. We had experimented with other systems to handle cast ductile iron fines and knew their benefits as well as their shortcomings.” Mark notes the company had actually designed two systems in-house to improve the handling of chips and the cleaning of coolant. While the benefits had been appreciable, they felt there was still a shortfall and the team at Accurate began a systematic search for a better solution. One of the potential vendors, Hennig, was an established force in the market, as the company’s chip conveyors and machine enclosures are found on many of the global machine tool builders’ equipment. A particular development from Hennig caught the attention of the team at Accurate, namely, a magnetic chip disc filtration system that represented a substantial improvement over the traditional drum screen filtration system used on most competing brands. The relative ease of changeover immediately impressed the Accurate engineers, both from the production and maintenance perspectives. As Mark explains, “Replacing the drum filter screens is not an easy task, in fact it can be downright miserable. The Hennig disc arrangement seemed to us a much easier system to operate and maintain. The incorporation of a rare earth drum & scraper assembly inside the conveyor appeared to be a great solution for minimizing the amount of cast iron fines reaching the coolant tank side of the system.” Mark notes the heavier-duty mechanical components and drive chains used on the Hennig conveyor were also impressive, providing a greater wear life and reduced downtime likelihood. An initial order was placed with Hennig for four Chip Disc Filtration (CDF) conveyors to run in tandem with the Niigata machines. All electrical controls, coolant tanks, pumps and other hardware were provided by Hennig. Mark and his team worked closely with the Hennig mechanical and electrical engineers, as well as the Hennig’s local representative, John Kaczmarek of Marathon Industrial Sales in Sterling Heights, Michigan, to complete the first installation. “We have over 40 years of experience in what works and what doesn’t in the machining of cast iron, so we had a very defined list of needs in all facets of the design, electrical functions and the very important aspect of machine to auxiliary equipment communication,” Mark notes, adding that the worst scenario in the shop occurs when the machining center is working, but the chip conveyor is not. Every aspect of the machine-to-conveyor connection was planned out by the Accurate team, including the layout of the coolant tank covers and the access ports. This attention to detail is something in which the company takes great pride. “The Hennig team was very good on this job and they realized that nothing less than their best efforts would satisfy us,” Tario notes. Among the many issues Accurate had to overcome, downtime for maintenance was the most prominent. 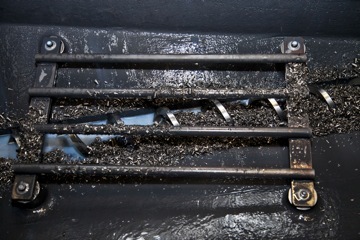 The machining of cast iron, by definition, creates considerable problems arising from the frequent need to replace conveyor chains, drum screens and other mechanical components that get infiltrated by the iron fines and literally lock up. The conveyor chains on the Hennig system, for example, were found stronger than the typical styles used on competing brands, which often required adjustments and repairs several times annually and were usually in need of total replacement, once a year. Depending on the severity of the repair or replacement operation, this situation resulted in many hours or even several days to rectify. Practically speaking, the maintenance personnel would get completely soaked and filthy with the coolant and sludge as a result. 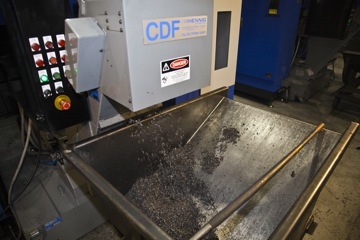 On the Hennig CDF system, by contrast, the discs can be easily removed and cleaned on a workbench, rather than reaching through narrow access ports to wrestle with a drum style filter. According to Mark, this entire process is a two-hour operation at most. Simple screen replacements can be done in thirty minutes or less, he notes. Accurate has already installed four Hennig systems, just received an additional three and has plans to purchase two more shortly, for a total of nine in the shop. All are connected to Niigata HMCs that have an opening in the back of the machine with a horseshoe-shaped channel where the conveyor fits. The overall machine size is 10’ wide by 30’ long. Other Accurate personnel involved in this project who contributed to the story include Greg Mann, plant manager, Dennis Shepp, maintenance technician and Jim Weeks, shift supervisor and maintenance technician. Hennig, Inc. designs and produces custom machine protection and chip/coolant management products for state-of-the-art machine tools. Hennig products are designed to protect against corrosion, debris and common workplace contaminants. Manufacturing facilities located in the USA, Germany, France, Brazil, India, Japan, Czech Republic, England and South Korea. Repair centers are located in Machesney Park, IL; Chandler, OK; Livonia, MI; Blue Ash, OH; Mexico City, Mexico; and Saltillo, Mexico. To learn more about Hennig products & services, visit www.hennigworldwide.com or call 1-888-HENNIG6 (436-6446). Accurate Gauge & Manufacturing, Inc.